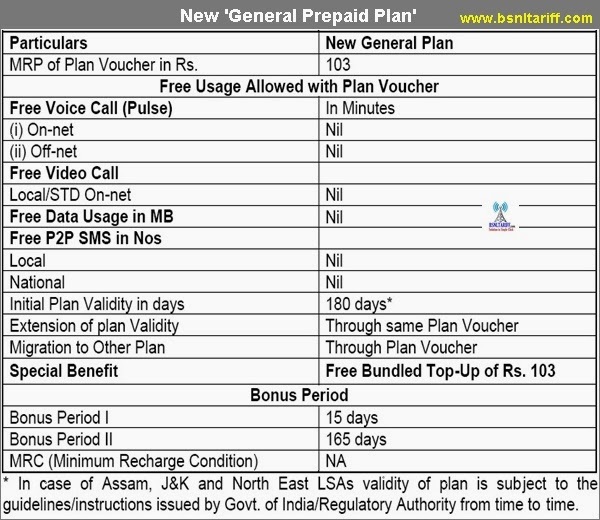 BSNL introduced new ‘General Prepaid Plan’ with initial validity for 180 days by following terms and conditions. India’s most trusted telecom brand Bharat Sanchar Nigam Limited (BSNL) has launched new ‘General Plan’ under GSM prepaid mobile services with MRP Plan Voucher of Rs.103/-. On activation of new ‘General Plan’ voucher of Rs.103/- Free Voice Calls for both On-net/Off-net; Free Video Call for Local/STD for On-net, Free P2P SMS for Local/National and Free data usage in MB will be offered ‘NIL’. Whatever the conditions applied for existing Prepaid General plan will be the same to this plan. This plan voucher works best for those customers who don’t want to recharge tariff plan vouchers available in their circle and use different Special Tariff Vouchers (STVs).All terms and conditions will be the same. The above Prepaid General plan will be implemented and with effect from 25-02-2014. Note: Implementation date or launch date of the above plan in each telecom circles may differ according to the technical feasibility and availability.